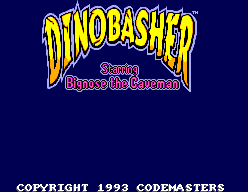 Dinobasher - Starring Bignose the Caveman - Games - SMS Power! 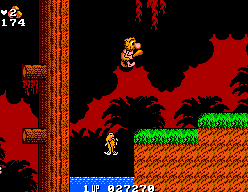 A port of Big Nose the Caveman (NES, 1991) that was never released. 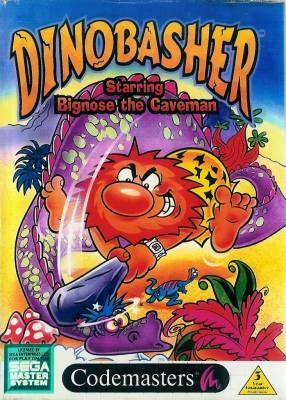 Join Bignose in a zany, prehistoric race to catch his dinner! Club your way through hoards of dinosaurs across four huge islands, collecting bones and rocks and trade with the natives. Fly between the islands using your club as helicopter rotors and become the first flying man! 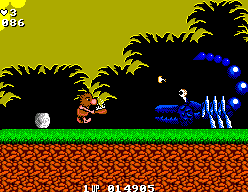 Great cartoon graphics, brilliant music and, most importantly, excellent fun!